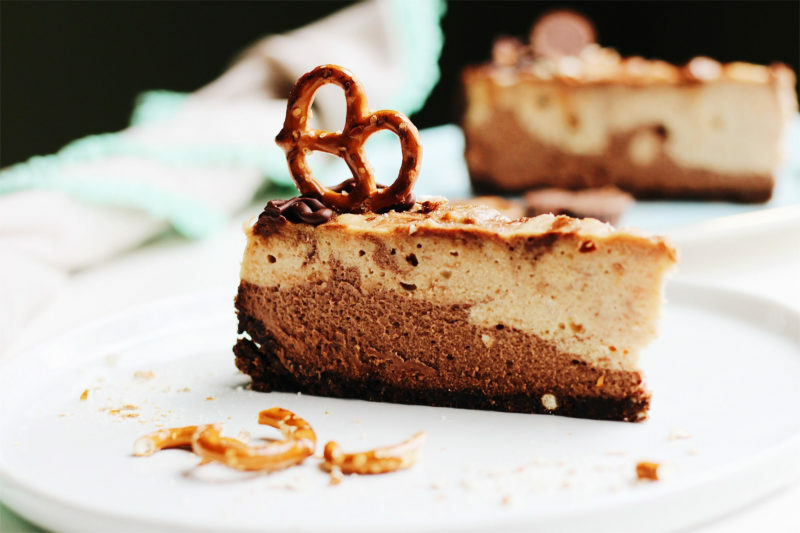 This Pretzel Peanut Butter Chocolate Cheesecake is the perfect balance of sweet and salty. Creamy, decadent, and sure to please any peanut butter lover. 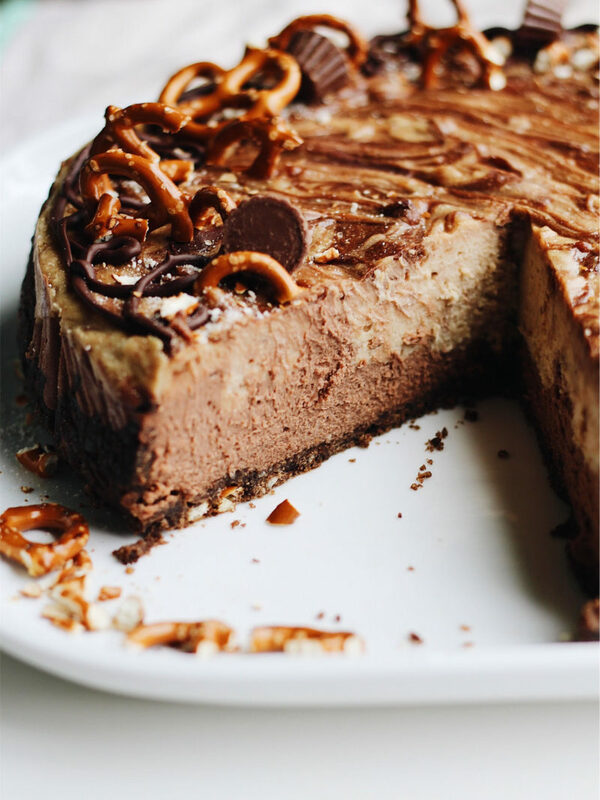 One of the things I get asked to make the most is cheesecake. Which is funny, because it’s one of the desserts I like the least. Well. I shouldn’t say that I dislike cheesecake, because I certainly don’t. But I’m pretty picky about it. Most cheesecakes are way too sweet for me. This one is obviously sweet (it is a cheesecake), but it’s so perfectly balanced. Balance is one thing I really dig. In my life, and in my food. I made this cheesecake for my husband. 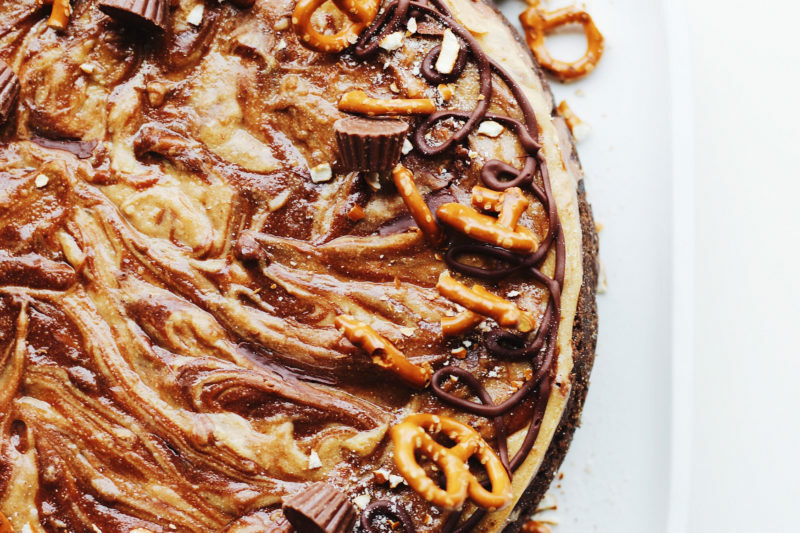 He’s a huge peanut butter aficionado, and he requested a peanut butter cheesecake for his birthday. Boring. I, of course, had to take his request and complicate his peanut butter cheesecake with some chocolate. Some salty pretzels. And maybe some more chocolate. 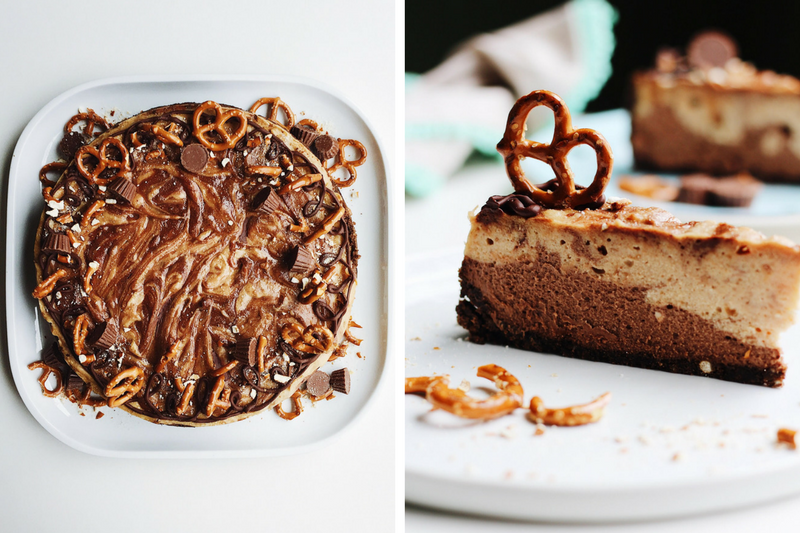 No need to make two different bases for this dreamy pretzel peanut butter chocolate cheesecake. I make one plain cheesecake base with cream cheese, sour cream, pure vanilla, and brown sugar. The base gets split evenly in half and divided into two bowls, where peanut butter gets mixed into one and melted semisweet chocolate into the other. 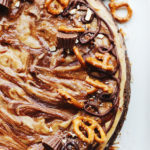 It then gets swirled together into a crust made from chocolate graham crackers, cinnamon, brown sugar, butter, and salted pretzels. 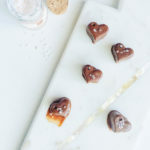 The molasses-laced brown sugar, nutty peanut butter, rich chocolate, and salty pretzels create a delicious and balanced flavor profile that isn’t too sweet. Sweet and salty. Creamy. The perfectly textured crust. 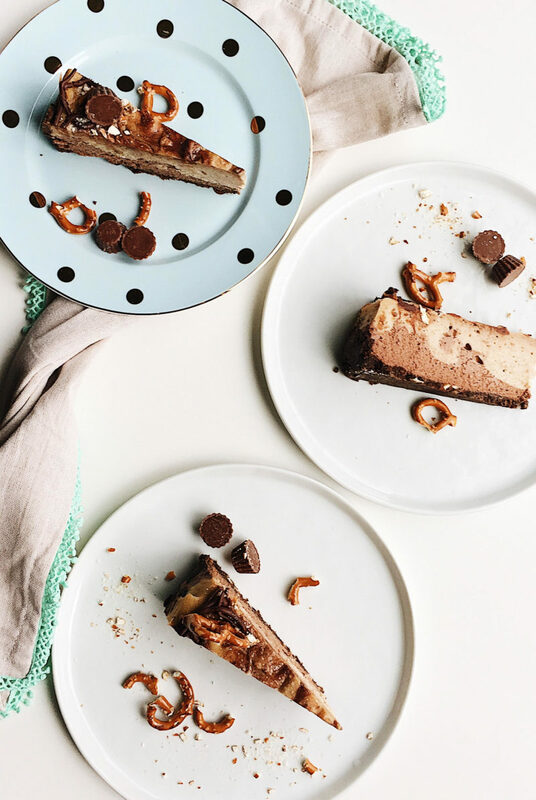 This Pretzel Peanut Butter Chocolate Cheesecake gets topped with mini chocolate peanut butter cups, a chocolate drizzle, and crushed pretzels, if you’re feeling crazy. …And I can see it in your eyes that you totally are. 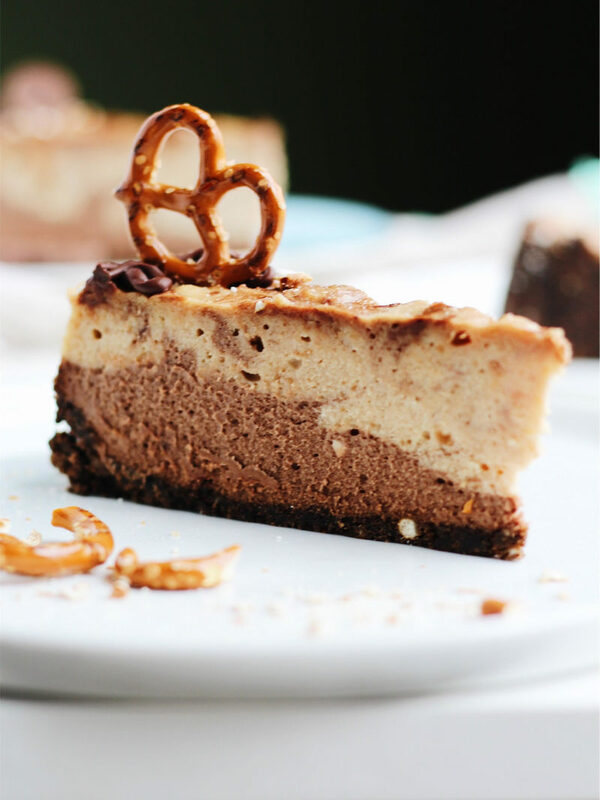 I hope that you make and enjoy this Sweet and Salty Pretzel Peanut Butter Chocolate Cheesecake! What are your favorite cheesecake flavors? Let me know in the comments below. 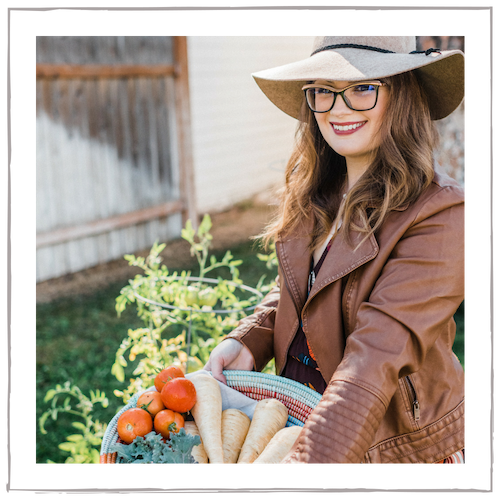 This post contains affiliate links, but are always products I love and highly recommend. Make the Crust: In a large bowl or food processor, mix the ground chocolate graham crackers, ground pretzels, cinnamon, and brown sugar with the melted butter until the mixture comes together and forms a ball when squeezed. Line a 10″ springform pan with parchment paper and lightly grease. Layer the outside of the pan with several layers of aluminum foil. Press the crust evenly into the bottom of the pan and about halfway up the sides. Freeze the crust for 10 minutes before baking. Bake for 10 minutes. Let the crust cool. 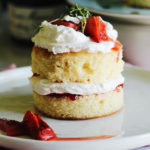 Make the Filling: In a standing mixer, beat room temperature cream cheese until smooth, about 1-2 minutes. Add the brown sugar and continue beating until smooth and a bit fluffy, another 2 minutes. Add the vanilla, salt, and the room temperature eggs, one at a time, beating on low until each egg is just combined. Do not over-mix. Do the rest by hand. Remove the bowl from the standing mixer and fold in the sour cream. Finally, fold in the flour until all of the flour is incorporated and everything is evenly mixed. Divide the cheesecake batter evenly between two bowls. In one bowl, fold in the creamy peanut butter. In the other, fold in the melted (but not hot) chocolate. Fill 3/4 of the chocolate batter into the cooled crust, followed by the peanut butter batter. Using a skewer or knife, swirl both batters together, ensuring not to disturb the crust. Drizzle the rest of the chocolate batter on top, gently swirling it in. Place the pan in a water bath and cook the cheesecake until almost set, about 50-55 minutes. The outside should be completely set when moved but the center should still be jiggly. Turn off the oven and let the cheesecake cool in the oven, with the door slightly ajar, for one hour. Remove from the oven and when completely cool, wrap with plastic and refrigerate overnight. 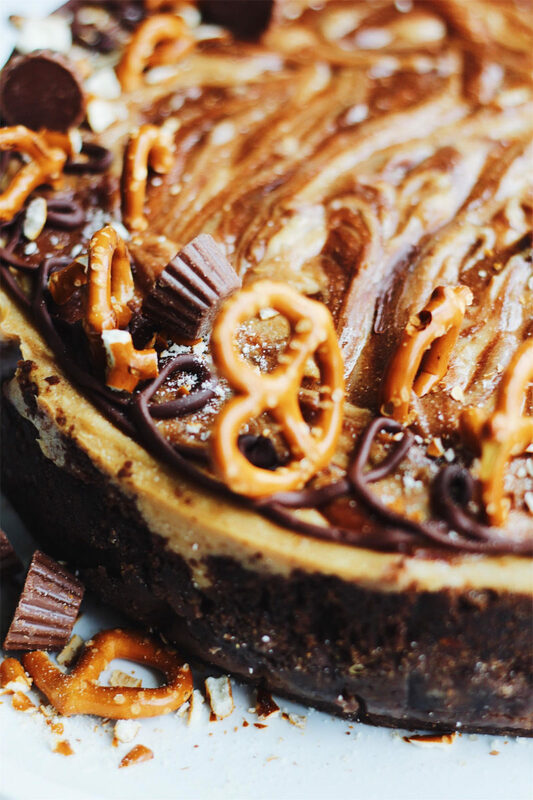 When ready to serve, unmold the cheesecake and top with a drizzle of chocolate, peanut butter cups, and crushed and whole pretzels. Enjoy! Not boring at all! Peanut butter + Chocolate is the best combination. This looks amazing! Holy smokes! 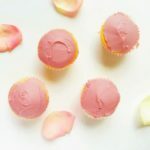 Can you make these and let me give you lots of money for them? Hahaha, I want at least 6 slices right now. 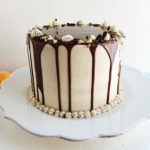 It looks so decadent and creamy, and that flavor combo is just perfect. Really wonderful photos too! OMG OMG! Is that a cake! You should copyright it right away! What an amazing idea..Love it! Great photography too. I’m very particular about cheesecake too but MAN does this look good! Peanut butter is my fav. Pinned! Ha! Ha! You are a woman after my own heart. I too like to complicate my baking adventures. But this is one complications that is definitely worth it because chocolate, peanut butter and pretzels are a match made in heaven. I’m with you, I don’t like overly sweet cheesecakes either. 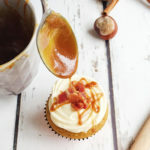 My husband is also a huge peanut butter lover and I need to make this for him. Boring you??? that’s one hell of a cake if you ask me!! Nothing boring at all! 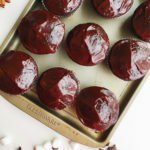 If you’re a chocolate lover you might want to try something with smoked chocolate! That brings a complete new dept to the chocolate stuff! 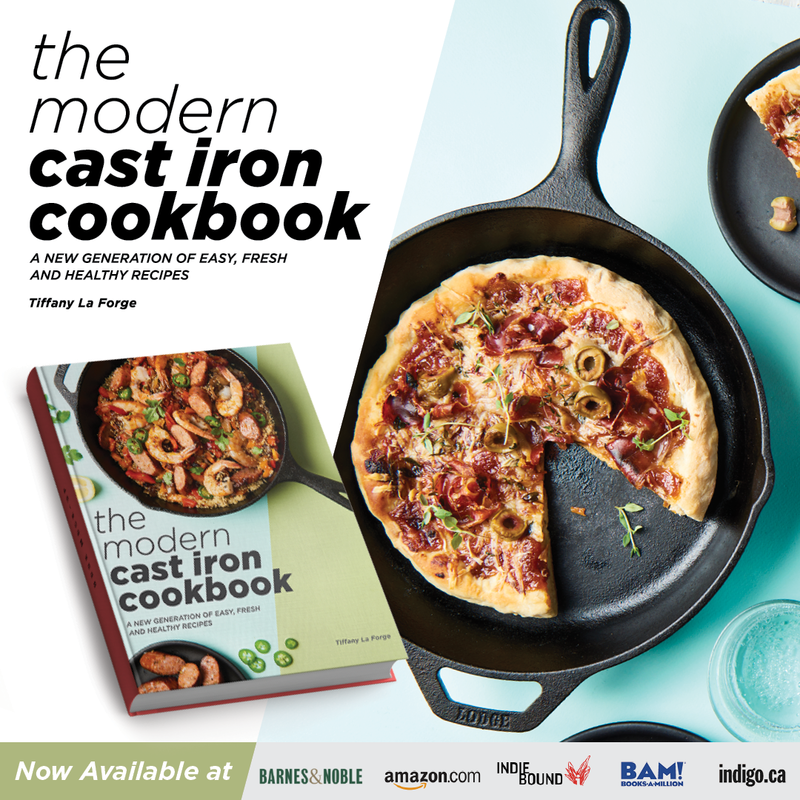 But I guess this recipe doesn’t need it… It looks stunning the way it is! My compliments! !